With compact yet spacious interiors, these memento boxes can hold endless possibilities, becoming whatever you choose to make them. From the cherished to the everyday, the objects held within will always be easy to find when stored in these decorative yet entirely functional and stackable boxes. 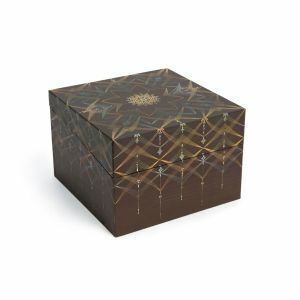 Whether being stacked or holding their own space, Paperblanks memento boxes are available in a wide selection of formats ideal for storing a variety of items. 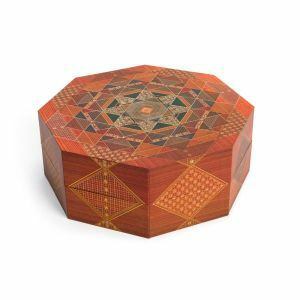 The lids of our memento boxes are every bit as beautiful as the rest of the box and slide elegantly and easily over the base to protect the items within. Our memento boxes are inspired by the work of Japanese “kirikane" artist Sayoko Eri and we have reproduced some of her designs and patterns using our own unique printing process. You can learn more about Sayoko Eri and kirikane on the historical information card contained within every memento box. You can rest assured that your precious keepsakes are secure in our memento boxes. 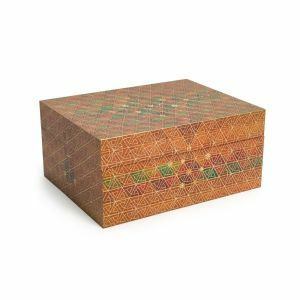 Though crafted from paper, these boxes are extremely sturdy with thick walls that hold up over the years.